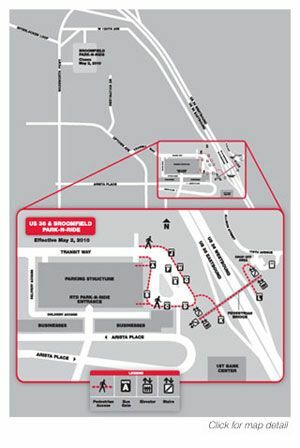 On May 2, 2010, the US 36 & Broomfield park-n-Ride, located near the 1ST BANK Center (formerly the Broomfield Event Center) replaced the existing Broomfield park-n-Ride. 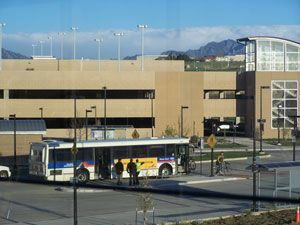 The new park-n-Ride and bus only slip ramps will provide commuters with more parking and a smoother commute into Boulder and Denver. A new pedestrian bridge will provide safe access across US 36. 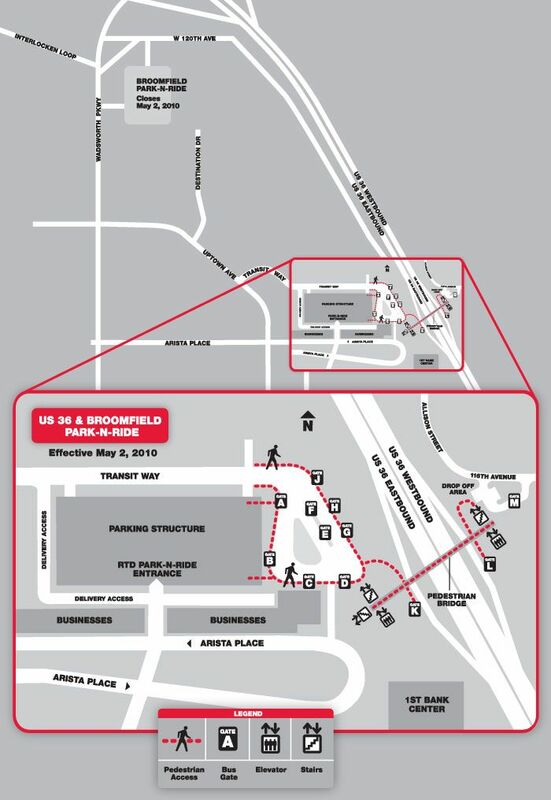 The old Broomfield park-n-Ride was moved from its location at Wadsworth and 120th Avenue to a new location at Wadsworth and Arista Place (8010 Transit Way) and was renamed US 36 & Broomfield park-n-Ride on May 2, 2010. See map below for details. Gates A through K are located on the southwest side of US 36. RTD parking is available in the parking structure. The Interlocken/Westmoor call-n-Ride’s pick-up and drop-off locations will be on the southwest side of US 36 at Gate F. call-n-Ride weekday service to FlatIron Crossing will be changed to 7:00 p.m. - 10:00 p.m. This will allow the call-n-Ride to continue to provide a high level of service to the existing call-n-Ride customers in the business parks and surrounding neighborhoods. Alternate service – Route 228 will continue to provide service to and from FlatIron Crossing until 7:00 p.m.
Gates L and M are located on the northeast side of US 36 and are accessed by the pedestrian bridge. No RTD parking is available on the northeast side of US 36. The Broomfield call-n-Ride will operate on the northeast side of US 36 where the new pedestrian bridge will allow access over US 36. The call-n-Ride will continue to have scheduled times, every half hour at Gate M. In addition, service to the area east of Main Street will be extended to operate from 5:30 a.m. to 8:00 p.m. Bus commuters save 6 to 8 minutes in each direction between Broomfield and Denver. Commuters save up to 15 minutes each way between Denver and Boulder. New parking structure provides 1,500 covered parking spaces compared to 905 spaces at the old Broomfield park-n-Ride. 940 spaces are specific to RTD passengers and the remaining are shared with 1ST BANK Center. New pedestrian bridge provides safe access across US 36. New park-n-Ride and bus only slip-ramps make commuting quick and easy. The new park-n-Ride demonstrates the progress of FasTracks in connecting communities and paves the way for an easier commute on US 36.